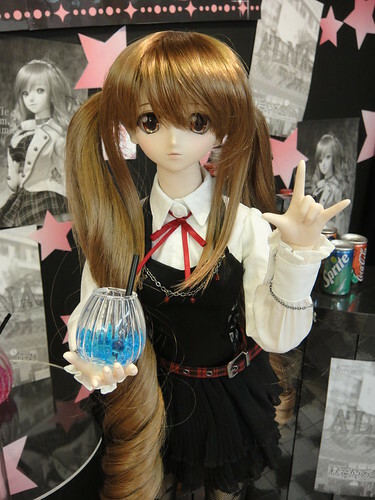 I adopted a Yukino v. 2 doll while I was in Tokyo last weekend at the Dollfie Dream Gathering (which I blogged about here) and she’s settled in at home with her new sisters already, but I wanted to share some photos of her at the Volks Akihabara showroom. 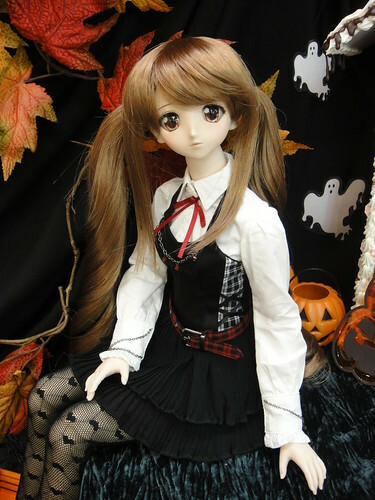 I brought some little things like stockings, shoes, a wig and Water Wax with me since I didn’t want her to be in her little white nightie and it was a great opportunity to show off the new Stylish Tartan Set that was released last weekend. I’ve named my new girl Mélisande d’Archangeli, but I’ll probably call her Mel or Melissa for short. 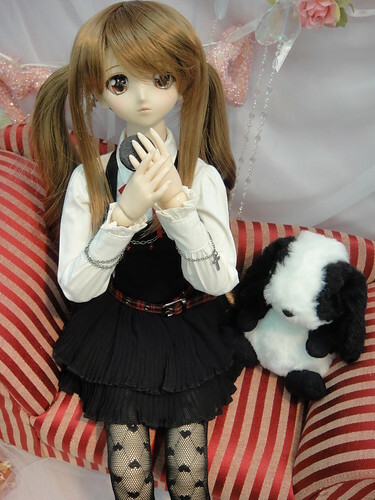 The promo pictures of this outfit showed a doll wearing a twin-tails wig and I loved the look so I got a twin-tails wig for Mel to wear. I think she looks adorable! 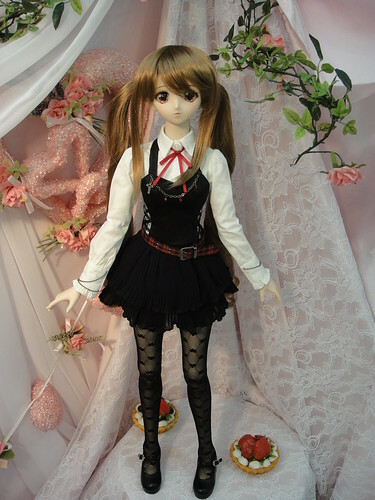 I didn’t remember to bring a doll stand, which was a bit troublesome but it’s a good thing that DD’s can stand on their own quite well. Here’s Mel rocking it out with Alna! This is one of the new option hands (09) that released this past weekend. 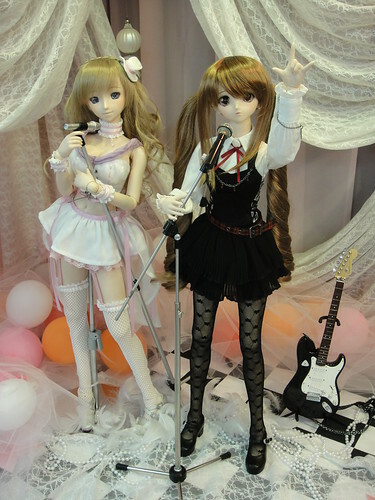 These two girls had lots of fun jamming together. While I wasn’t looking Mel wandered behind the bar at the club! 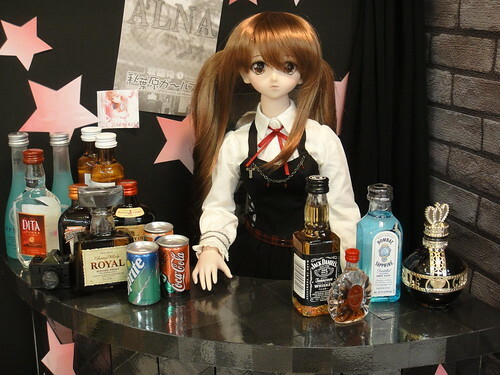 Anyone want a drink? How about a Blue Lagoon? Looks tasty! Here’s Yukino trying to blend in with the Halloween Jack-o-lanterns. I think she’s way too cute to be a Halloween pumpkin! 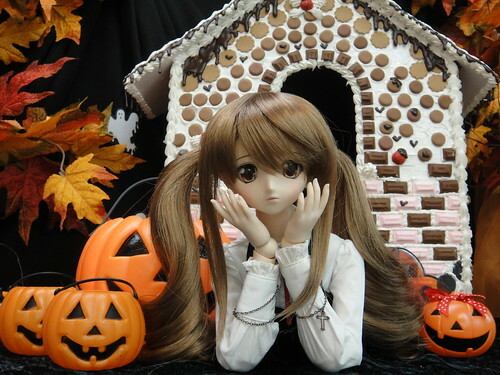 This gingerbread candy house is super cute! 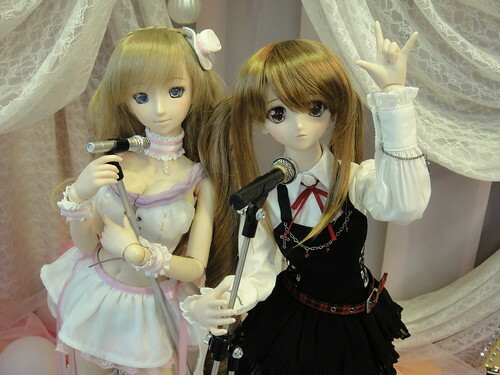 Here’s Mel with Mikuru Asahina DD in the showroom. Since the Tenshi-no-Sumika is on the third floor of the Volks building, you have to go down a stairwell to get to the exit. 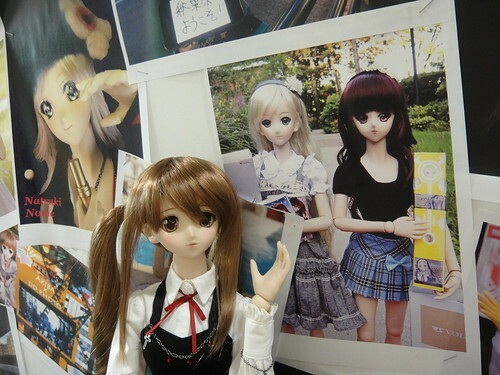 The halls are decorated with photo entries from the “Akihabara” themed photo contest that Volks held in August. I was so surprised to see the picture that Kev & I sent in as part of the display! Here’s Mélisande proudly showing off the picture of her sisters Lily & Makoto. 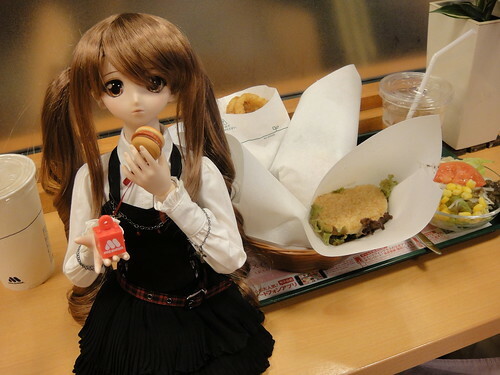 Rather than pack her up again, I brought Mel out with me to check out a bit of Tokyo. 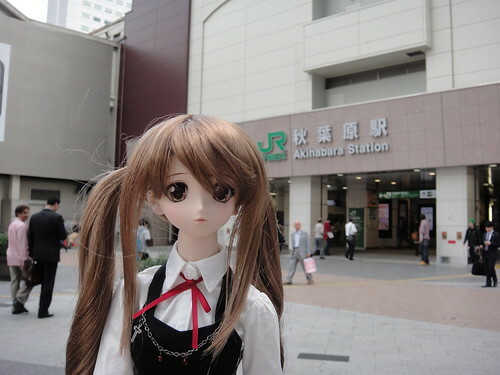 Here she is outside the Akihabara JR station. This is the opposite side of the Electric Town exit, close to where the new Volks showroom is. 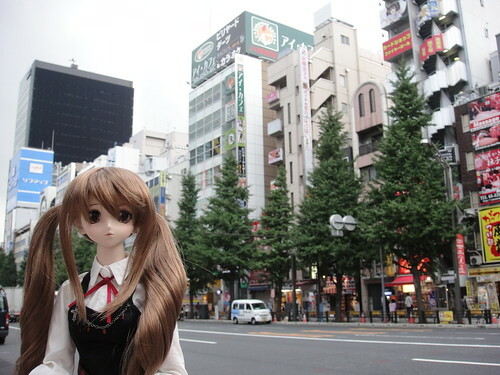 Here’s Mel out and about in Akihabara. 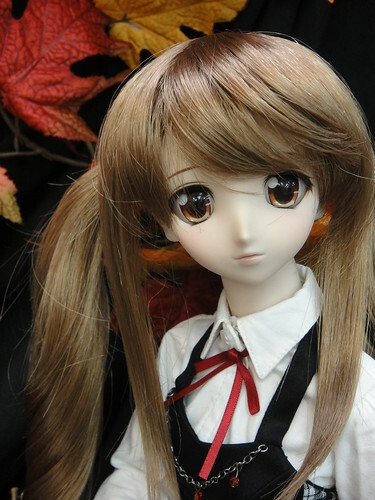 There are lots of shops where you can get manga, figures, electronic goods and of course, doll goodies! After all the photo-taking and shopping everyone was hungry so we stopped in at MOS Burger for a quick bite to eat. I love the teriyaki rice burgers, but Mel opted for a classic MOS burger. Omnomnom. Thanks for reading! I’ll be posting more pictures of Mélisande, as well as a few photos from my trip to Tokyo in the days to come. Cheers! 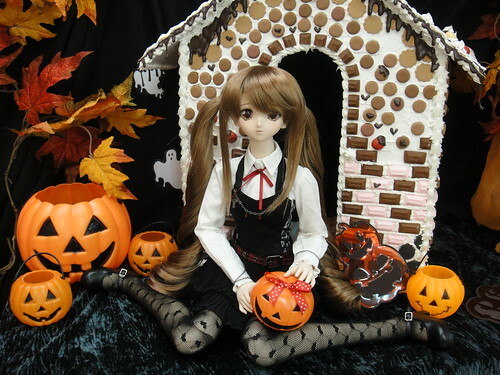 This entry was posted in Doll Box Opening, Dollfie Dream and tagged Dollfie Dream, Mélisande, Volks, Yukino by archangeli. Bookmark the permalink. 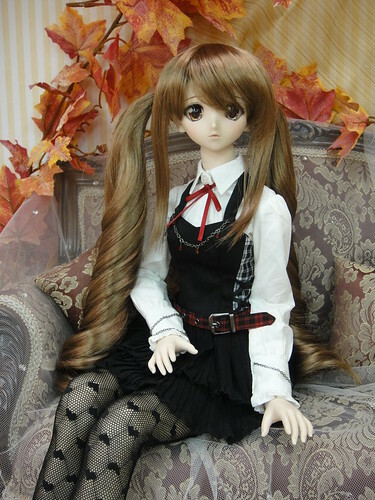 I want this dollfie dream. She is very cute. OMG!!!!! In that magazine behind your doll is a pic with a DD holding a little ONE!!!!!!!!! Must get tiny one!!!!!!! It wasn’t a magazine oops….. 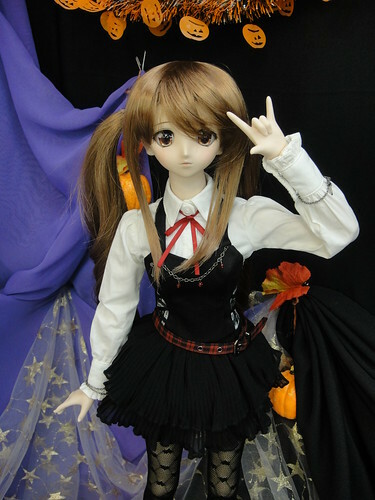 I really want that teeny tiny DD that custom is holding!!!!!! Thanks! It’s a prop my hubby made for that photo.